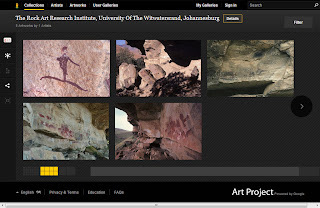 Ancient African cave paintings will become available online as Google partners with the South African National Gallery and Wits Rock Art Research Institute. Art from the Giant's Castle Nature Reserve and Kamberg Nature Reserve will go online as well as several works by artists such as Sophie Peters, Thami Mnyele and Alexis Preller. Virtual visitors can browse them via Google's Art Project. "We encourage you to come to make a pilgrimage to these special sites. Be inspired - by visiting these sites you will not only have a life changing journey into the African past, you will be helping to preserve our priceless heritage for future generations," said Professor Benjamin Smith, director of the Rock Art Research Institute. The project is part of Google's programme of illustrating unique sites, including the Amazon and a recent partnership with the Catlin Seaview Survey which allows visitors to have a 360° view of the Great Barrier Reef. "Through the Art Project we’re aiming to bring local history and culture online and make it accessible," said Dr Julie Taylor, Google's head of communications for Sub-Saharan Africa.